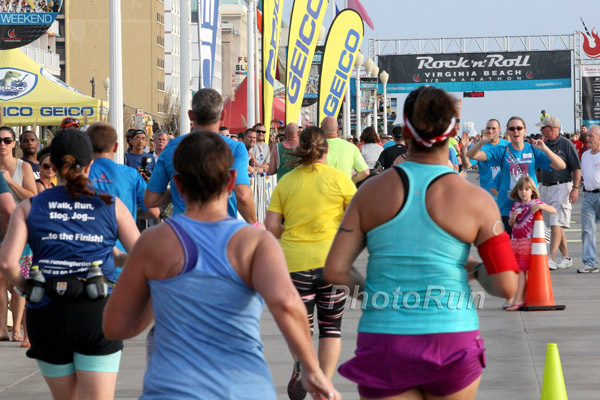 It’s been four weeks since I ran RnR Virginia Beach but I have regained my running mojo and have such fond memories of the race that I decided to post this delayed recap. Besides, the fact that I left the State to get there makes it noteworthy. 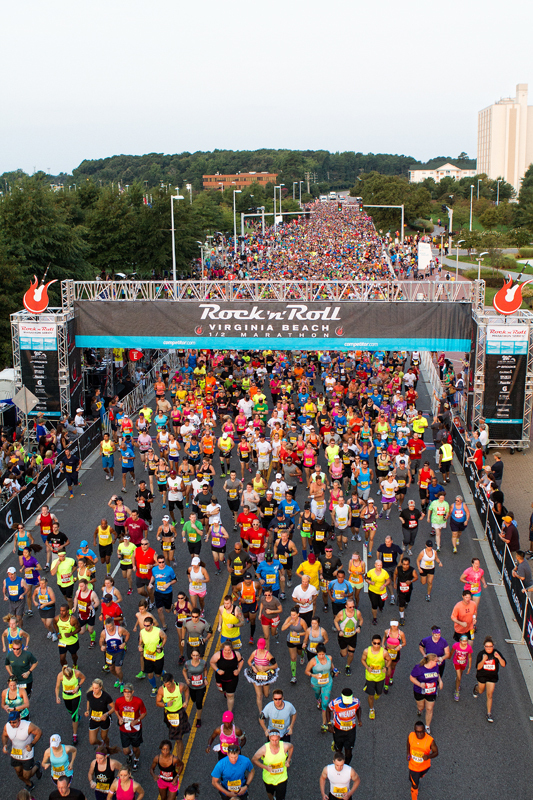 Everyone has an opinion about the Rock ‘n’ Roll race series and I won’t get into all of that but I will say that I have enjoyed the three races that I have run with them. Now, the disclaimer that should have been posted about the race was that if you were driving in from out of town you should be aware that there was a possibility that you would have to cross this bad boy. 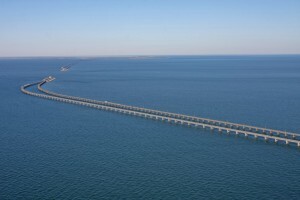 That’s the Chesapeake Bay Bridge Tunnel aka The Beast Bridge. It is 20 miles long and turns into an underwater tunnel at two points. At a certain point you can’t see any land while on the bridge. Actually, it is possible that land was visible behind me but I’m no fool. I was not about to take my eyes off the piece of thread in front of me that was posing as a bridge. No siree bob. Turns out the Beast Bridge route shaved 90 minutes off my drive from New York to Virginia Beach and I desperately needed that time because I barely made the 5:00 p.m. packet pick-up at the expo … and a fine expo it was. 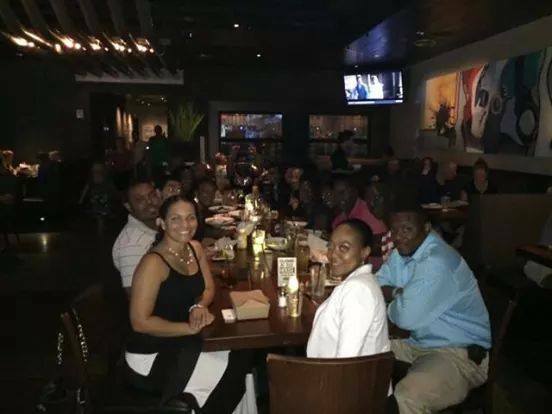 After picking up my bib and a pair of compression sleeves, I rushed on over to The Yard House to have dinner with members of the National Black Marathon Association. I had a great time meeting fellow runners and indulging in some unnecessary tasty carb loading. 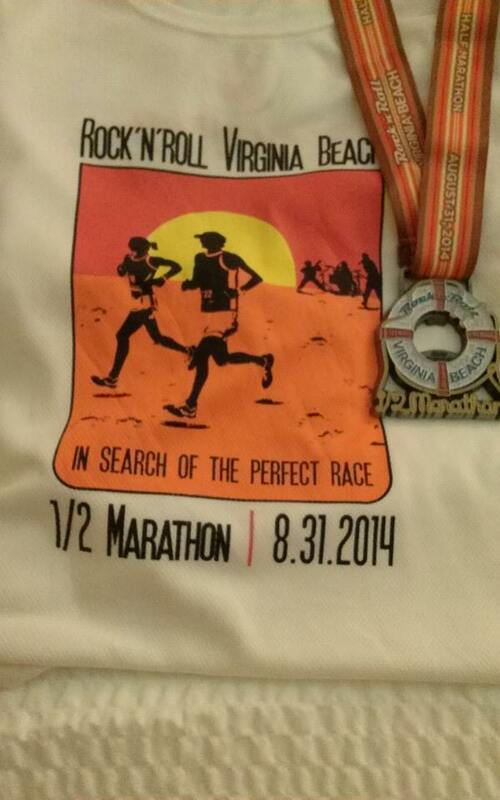 Since the hotel prices were inflated due to Labor Day weekend and probably the race, I chose to stay in Chesapeake. Besides, the only two hotels (um, cough cough … motels) on the Boardwalk that weren’t sold out resembled overpriced dingy tenements. The good news is that plenty of complementary shuttle buses were provided at the Farm Bureau Live Amphitheater to transport the runners to and from the race start and finish. That worked out beautifully. Onward to the race. After arriving at the at the start location, I saw that there had been food provided. I had already fueled but thought that was a nice option. It was warm for a 7:00 a.m. start but I deliberately had not checked the weather because I heard the race was typically hot and I didn’t want to psych myself out. 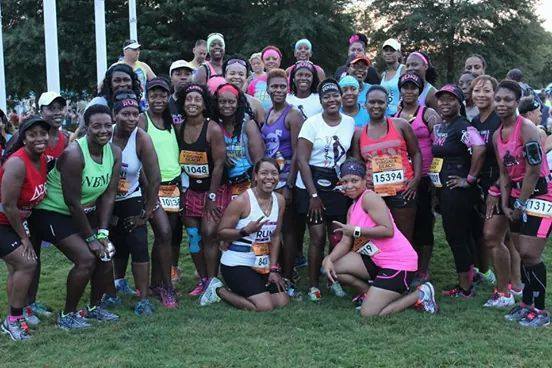 There was a large contingency from Black Girls Run! and Half Fanatics and so I took pictures with them and started the race with Tammy and Loretta, two awesome BGR! members from Greensboro, NC. By the end of mile one I was sweating like a pig. 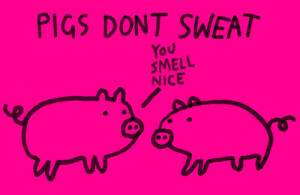 I’m not even sure if pigs sweat. Anyway, I was drenched and at that point realized that it was super humid. Despite the heat and humidity, I was feeling pretty good and was enjoying the bands playing along the way. The race was still very congested at mile 3 and I lost my buddies at the water station. After mile 4 a band was rocking out to Michael Jackson’s Bad and not too long after that the spectators started cheering so hard that I ran a little taller. Just as I was beginning to think I was a rockstar, I realized that the crowd, as well as other runners, were actually cheering for the front runners who were on their way back to the finish line … nice. No really, good for them. So I plugged on and it got hotter and hotter. Hats off to Competitor for being prepared though. All of the water stations were where they were supposed to be and there was a wet sponge station and some sort of misting device to run through. Of course I ran around it because I didn’t realize what it was until it was too late. There were also local people along the race course who were spraying the runners with water. Bless their hearts. I was trucking along until around mile 11 when I realized that if I sped up a little, I could actually blast my PR by a few minutes. So now I’m running faster than I should be considering the weather conditions and I realize that it is blazing hot. At some point I zoned out and by the time I completed mile 12 and looked at my watch, it became apparent that I really hadn’t been running that fast at all. 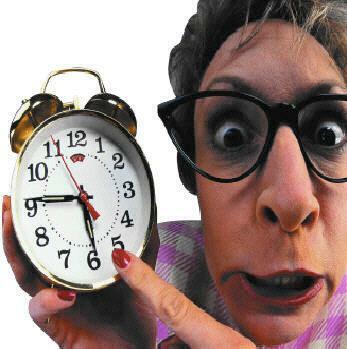 The PR was slipping away so I stepped it up and kept a watchful eye on my watch. It was looking attainable again but then a steep hill in the form of a ramp appeared. The nerve!!! I suddenly recalled that we climbed a hill in the first mile and since this was an out and back course, I should have been expecting it. I zipped by bunch of runners who opted to walk the hill. Walking it was probably the smart thing to do but I was on a mission. With the hill conquered, my new problem was that my watch was ahead of the course. It was telling me that I had already run 13 miles but the 13 mile course marker was nowhere to be seen. I hate that but really it happens all the time. Soon, I find myself on the Boardwalk. Awesomeness, the race is coming to a close. But wait, I can’t see the finish line. Just how long is this Boardwalk and do we have to run the entire thing???? I finally see the finish line in the distance. I barrel towards the arch but it just doesn’t seem to be getting any closer. My watch tells me I’m moving at a nice clip but if I don’t get there soon the PR is gone. And that wouldn’t be the worst thing but to get so close and miss is the worst thing, so I keep at it. The elusive finish line starts to get bigger. I am so close. Now I throw whatever decent running form I had left out the window. I am taking giant steps and I’m pumping my arms to get to the finish. I cross the line and PR by exactly one minute. Now, all I want to do is lay down on the Boardwalk but my legs feel like lead and I know I have to keep moving. So I keep walking. There are lots of giveaways and I’m picking up my chocolate milk, Gatorade, apple, chip and the like but I am feeling uncomfortable and super cranky. It suddenly becomes too much for me to walk and carry all of my goodies. So I start looking for a bag to put them in. Apparently, a vendor was giving away orange tote bags but it must have been located a mile down the Boardwalk because I never reached it. After carrying on about needing a plastic bag, a nice volunteer found me a massive plastic bag. I was satisfied until the unfortunate thing happened. I saw a Dairy Queen right as I was leaving the Boardwalk. I haven’t been within 100 feet of a Dairy Queen in over 15 years and miraculously there was an empty table right next to it. But I was so cranky and afraid to stop and sit that I felt compelled to keep moving. I felt like the man in the picture below. 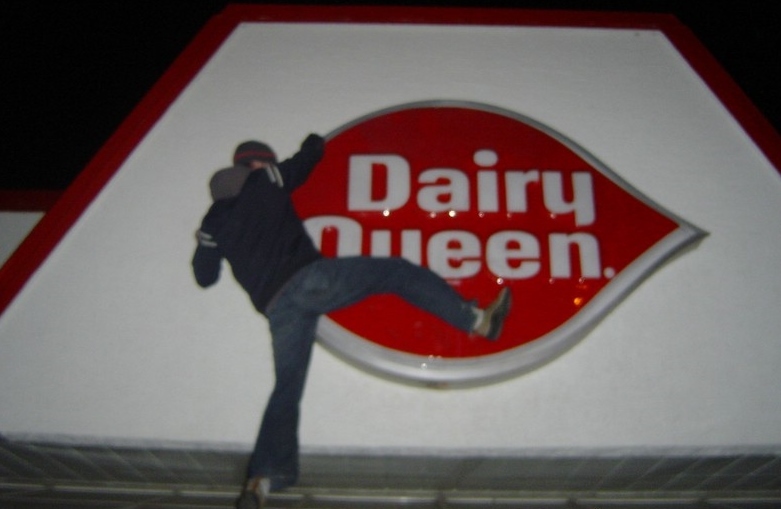 I was angry at Dairy Queen for being there. I finally made it to the air conditioned shuttle and took my well earned seat. Surprisingly, after an ice bath and a few minutes in my compression sleeves, I was feeling good enough to jump in the car to travel to my next destination, which was Georgia. All in all it was a great experience even though the course wasn’t the most inspiring. 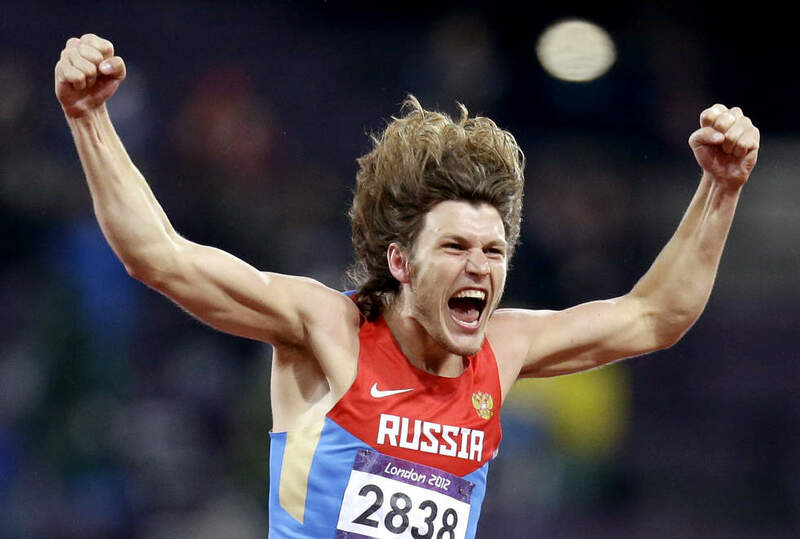 The medal pictured above is really nice and doubles as a bottle opener. Although I wasn’t able to participate, runners were able to compete in a One Mile Run on the Beach the day before the Half Marathon. The One Miler came with its own medal and those who did both races received a third medal. So it was a potential bling bonanza. Competitor gets a thumbs up on this one.